Italy has a well developed transport infrastructure. The Italian rail network is extensive, especially in the north, and it includes a high-speed rail network that joins the major cities of Italy from Naples through northern cities such as Milan and Turin. Italy has 2,507 people and 12.46 km2 per kilometer of rail track, giving Italy the world's 13th largest rail network. Because of its long seacoast, Italy also has a large number of harbors for the transportation of both goods and passengers. Transport networks in Italy are integrated into the Trans-European Transport Networks. A major part of the Italian rail network is managed and operated by Ferrovie dello Stato Italiane, a state owned company. 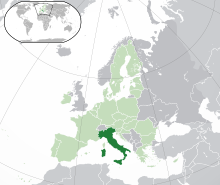 Other regional agencies, mostly owned by public entities such as regional governments, operate on the Italian network. The Italian railways are subsidised by the government, receiving €8.1 billion in 2009. Travellers who often make use of the railway during their stay in Italy might use Rail Passes, such as the European Inter-Rail or Italy's national and regional passes. These rail passes allow travellers the freedom to use regional trains during the validity period, but all high-speed and intercity trains require a 10-euro reservation fee. Regional passes, such as "Io viaggio ovunque Lombardia", offer one-day, multiple-day and monthly period of validity. There are also saver passes for adults, who travel as a group, with savings up to 20%. Foreign travellers should purchase these passes in advance, so that the passes could be delivered by post prior to the trip. When using the rail passes, the date of travel needs to be filled in before boarding the trains. Major works to increase the commercial speed of the trains already started in 1967: the Rome-Florence "super-direct" line was built for trains up to 230 km/h, and reduced the journey time to less than two hours. This is the first high-speed train line in Europe, as its operations started in 1977. In 2009 a new high-speed line linking Milan and Turin, operating at 300 km/h, opened to passenger traffic, reducing the journey time from two hours to one hour. In the same year, the Milan-Bologna line was open, reducing the journey time to 55 minutes. Also the Bologna-Florence high-speed line was upgraded to 300 km/h for a journey time of 35 minutes. Since then, it is possible to travel from Turin to Salerno (ca. 950 km) in less than 5 hours. More than 100 trains per day are operated. The main public operator of high-speed trains (alta velocità AV, formerly Eurostar Italia) is Trenitalia, part of FSI. Trains are divided into three categories: Frecciarossa ("Red arrow") trains operate at a maximum of 300 km/h on dedicated high-speed tracks; Frecciargento (Silver arrow) trains operate at a maximum of 250 km/h on both high-speed and mainline tracks; Frecciabianca (White arrow) trains operate at a maximum of 200 km/h on mainline tracks only. Since 2012, a new and Italy's first private train operator, NTV (branded as Italo), run high-speed services in competition with Trenitalia. Even nowadays, Italy is the only county in Europe with a private high-speed train operator. Construction of the Milan-Venice high-speed line has begun in 2013 and in 2016 the Milan-Treviglio section has been opened to passenger traffic; the Milan-Genoa high-speed line (Terzo Valico dei Giovi) is also under construction. Today it is possible to travel from Rome to Milan in less than 3 hours (2h 55') with the Frecciarossa 1000, the new high-speed train. To cover this route, there's a train every 30 minutes. With the introduction of high-speed trains, intercity trains are limited to few services per day on mainline and regional tracks. The daytime services (Intercity IC), while not freuquent and limited to one or two trains per route, are essential in providing access to cities and towns off the railway's mainline network. The main routes are Trieste to Rome (stopping at Venice, Bologna, Prato, Florence and Arezzo), Milan to Rome (stopping at Genoa, La Spezia, Pisa and Livorno / stopping at Parma, Modena, Bologna, Prato, Florence and Arezzo), Bologna to Lecce (stopping at Rimini, Ancona, Pescara, Bari and Brindisi) and Rome to Reggio di Calabria (stopping at Latina and Naples). In addition, the Intercity trains provide a more economical means of long-distance rail travel within Italy. The night trains (Intercity Notte ICN) have sleeper compartments and washrooms, but no showers on board. Main routes are Rome to Bolzano/Bozen (calling at Florence, Bologna, Verona, Rovereto and Trento), Milan to Lecce (calling at Bologna, Rimini, Ancona, Pescara, Bari and Brindisi), Turin to Lecce (calling at Alessandria, Voghera, Piacenza, Parma, Bologna, Rimini, Pescara, Bari and Brindisi) and Reggio di Calabria to Turin (calling Naples, Rome, Livorno, La Spezia and Genova). Most portions of these ICN services run during the night; since most services take 10 to 15 hours to complete a one-way journey, their day-time portion provide extra train connections to complement with the Intercity services. There are a total of 86 intercity trains running within Italy per day. Trenitalia operates regional services (both fast veloce RGV and stopping REG) throughout Italy. Regional train agencies exist: their train schedules are largely connected to and shown on Trenitalia, and tickets for such train services can be purchased through Trenitalia's national network. Other regional agencies have separate ticket systems which are not mutually exchangeable with that of Trenitalia. These "regional" tickets could be purchased at local newsagents or tobacco stores instead. Trentino-Alto Adige / Trentino-Südtirol: Südtirol Bahn (South Tyrol Railway) runs regional services on Ala/Ahl-am-Etsch to Bolzano/Bozen (calling at Rovereto/Rofreit, Trento/Trient and Mezzocorona/Kronmetz), Bolzano/Bozen to Merano/Meran, Bressanone/Brixen to San Candido/Innichen, and a direct "Tirol regional express REX" service between Bolzano/Bozen in Italy and Innsbruck in Austria. Veneto: Sistemi Territoriali runs regional trains in Veneto region. Lombardy: Trenord runs the Malpensa Express airport train, many Milan's suburban lines and most regional train services in Lombardy. Trenord also co-operates with DB and ÖBB on the EuroCity Verona-Munich service, and with SBB CFF FFS (joint-venture TiLo) on the regional Milan-Bellinzona service. Emilia-Romagna: Ferrovie Emilia Romagna provides vital connections across cities on different mainline networks, including Modena, Parma, Suzzara, Ferrara, Reggio Emilia and Bologna. Tuscany: La Ferroviaria Italiana operates in Arezzo province. Abruzzo: Sangritana runs daily services between Pescara and Lanciano. In addition to these agencies, there's a great deal of other little operators, such as AMT Genova for the Genova-Casella railway. AnsaldoBreda train for the Brescia Metro. A station of the new M5 line of Milan. Italy has 11 rail border crossings over the Alpine mountains with her neighbouring countries: six are designated as mainline tracks and two are metre-gauge tracks. The six mainline border crossings are: two with France (one for Nice and Marseille; the other for Lyon and Dijon), two with Switzerland (one for Brig, Bern and Geneva; the other for Chiasso, Lugano, Lucerne and Zürich), and two with Austria (one for Innsbruck; the other for Villach, Graz and Vienna). The two metre-gauge track crossings are located at the border town of Tirano (enters Switzerland's Canton Graubünden/Grisons) and Domodossola (enters Switzerland's Locarno). There is a railway line connecting Italy's northeastern port of Trieste to Slovenia, but no passenger or freight services operate on this track. Consequently, there is no direct connections between Trieste and Ljubljana, the capital of Slovenia, despite the proximity of both cities. Italy-France: Marseille-Ventimiglia railway, currently EuroCity trains of Thello Milan-Marseille and one EuroNight train of RZD Moscow-Nice. The Vatican City is also linked to Italy with a railway line serving a single railway station, the Vatican City railway station. This line is used only for special occasions. San Marino used to have a narrow gauge rail connection with Italy; this was dismantled in 1944. Italy is one of the countries with the most vehicles per capita, with 690 per 1000 people in 2010. Italy has a total of 487,700 km of paved roads, of which 6,758 km are motorways with a general speed limit of 130 km/h (81 mph), which since 2009 was provisioned for extension up to 150 km/h (93 mph). The speed limit in towns is usually 50 km/h (31 mph) and less commonly 30 km/h (19 mph). Italy has 2,400 km (1,491 mi) of navigable waterways for various types of commercial traffic, although of limited overall value. In the northern regions of Lombardy and Venetia, commuter ferry boats operate on Lake Garda and Lake Como to connect towns and villages at both sides of the lakes. The waterways in Venice, including the Grand Canal, serve as the vital transportation network for local residents and tourists. Frequent shuttle ferries (vaporetta) connect different points on the main island of Venice and other outlying islands of the lagoon. In addition, there are direct shuttle boats between Venice and the Venice Marco Polo Airport. Italy's largest airline is Alitalia, which was privatised in 2008. Its main hub is Rome Fiumicino Airport. Alitalia also operates a regional subsidiary under the Alitalia CityLiner brand. Italy's second largest airline is Air Italy, which operates a network of domestic, European and long-haul destinations from its main hub at Milan Malpensa Airport. An important regional airline is Air Dolomiti, owned by the German Lufthansa Group. Low-cost carriers include Ernest Airlines, while Charter and leisure carriers include Neos, Blue Panorama Airlines and Mistral Air. Major Italian cargo operators are Alitalia Cargo and Cargolux Italia. Italy is the fifth in Europe by number of passengers by air transport, with about 148 million passengers or about 10% of the European total in 2011. Most of passengers in Italy are on international flights (57%). A big share of domestic flights connect the major islands (Sardinia and Sicily) to the mainland. Domestic flights between major Italian cities as Rome and Milan still play a relevant role but are declining since the opening of the Italian high-speed rail network in recent years. Rome Fiumicino airport, the busiest in Italy. This is a list of the top ten busiest airports in Italy in 2017. There are long-distance intercity buses run by local companies, but the services are infrequent during the week and usually provide a secondary link to railway services. This makes a daily total of 12 services in each direction between Rome and Bologna. Flixbus, a company founded in the course of the opening of the German intercity bus market also serves routes in Italy both domestic and international. Airport shuttle buses, however, are highly developed and convenient for rail travellers. Most airports in Italy are not connected to the railway network, except for Rome Fiumicino Airport, Milan Malpensa Airport and Turin Caselle Airport. In Bologna, a light-rail track is under construction to connect Bologna Airport to the main railway station. Local buses are usually divided into urban (urbano) and suburban (interurbano or extraurbano) lines. ^ Compare List of countries by rail transport network size. ^ "La rete oggi". RFI Rete Ferroviaria Italiana. Archived from the original on 4 December 2011. Retrieved 15 November 2011. ^ "Rail Passes - ItaliaRail - Italy Train Ticket and Rail Pass Experts". www.italiarail.com. ^ "Viaggia con i treni Frecciarossa e acquista il biglietti a prezzi scontati - Le Frecce - Trenitalia". www.trenitalia.com (in Italian). Retrieved 14 May 2017. ^ "La Ferrovia dello Stato della Città del Vaticano" (in Italian). Sala stampa della Santa Sede. Retrieved 9 January 2012. ^ "la "Ferrovia Rimini - San Marino"" (in Italian). www.ferroviedismesse.com. Retrieved 6 January 2012. ^ John Sousanis (15 August 2011). "World Vehicle Population Tops 1 Billion Units". Ward AutoWorld. Archived from the original on 27 August 2011. Retrieved 27 August 2011. ^ a b c "Italy". The World Factbook. CIA. Retrieved 8 January 2012. ^ "Italy: Alitalia still dominant on domestic routes; 3rd behind Ryanair/easyJet on intl/EU". anna.aero. Retrieved 7 October 2012. ^ Di Leo, Luca; Sorlini, Gordon (21 November 2008). "Alitalia Rescue Plan Receives Governmental Green Light". The Wall Street Journal. Retrieved 24 December 2016. ^ "Ciao Meridiana, welcome AIR ITALY" (PDF). Air Italy. 1 March 2018. ^ a b "Trasporto aereo in Italia (PDF)". ISTAT. Retrieved 5 August 2013. ^ "Statistiche Dicembre 2017". assaeroporti.com. Retrieved 23 July 2018. ^ "Getting to Italy and getting around". TripAdvisor. Retrieved 14 February 2016.